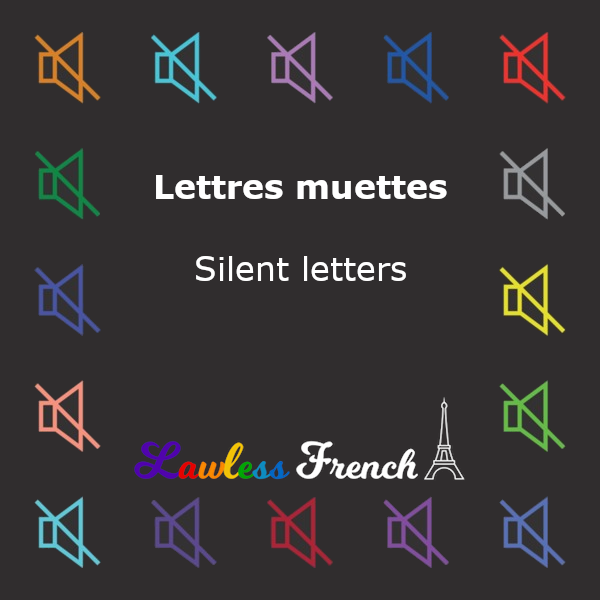 French has a lot of silent letters, which can make pronunciation and spelling exasperating—at least until you learn the rules and patterns to these sneaky non-sounds. Rumor has it that most final consonants are silent, but that tricky word "most" is where the problems start. Students learn the mnemonic CaReFuL to remember the supposedly four consonants which are typically pronounced at the end of a word, while all others are typically silent. However, it’s not quite that simple. Six consonants are usually silent at the end of a word; however, they may be subject to liaison. Many of the exceptions are either proper names or words borrowed from other languages. The letter N and the combination NG are nearly always nasal at the end of a word, meaning that they are not pronounced as consonants, but rather nasalize the vowel that precedes them. footing, riesling The g at the end of –ing isn’t pronounced [g] but it’s not a simple nasal either – learn more. In the case of B and G , those are loan words from other languages. And for K and Q , they are the same sound as C thats why in linguistics we represent that sound with a K in IPA. So, really, CaRFuL still holds true. The CaReFuL rule is about those four letters, not those four sounds. And loan words matter too, plus what about M? Like I said, it’s just not that simple.